ThermalDry® floor tiles provide a thermal break between the slab and the floor, making it more comfortable – especially for kids! Because heat rises in a home, only about 1% of a home's energy is lost through the basement floor. Therefore, insulating the basement floor is not as great a concern as insulating the basement walls or basement windows would be. However, in a finished basement, a homeowner who uses the basement is going to be in continuous contact with the floor, and is going to want the floor to be a warm and comfortable surface. Total Basement Finishing has proven solutions for basement flooring options that will provide comfort and moisture resistance. 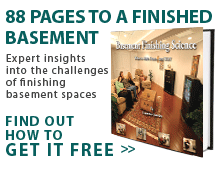 To schedule a free estimate for basement flooring, contact your local TBF dealer by clicking below! If you install tile, carpeting, or other materials on the floor, cold and moisture from the floor is going to collect in the material. Anything organic will rot, and the cold surface will be unpleasant underfoot. Instead of living with this situation, it's best to first install an insulated sub floor on the basement floor that will create a thermal break between the cold concrete and the surface. Total Basement Finishing offers a completely inorganic basement sub floor called ThermalDry® Flooring that will never rot or support mold growth and is perfect for the job. Available in carpeted and tiled designs, they are also provided in an unfinished floor tile that's perfect for your own carpeting and matting. Because these inorganic vinyl floor tiles sit on raised pegs, there is an airspace underneath that allows the flooring's surface to be as much as ten degrees warmer than the concrete below! As part of a complete insulated basement, the TBF basement finishing system is specifically designed for basements, keeping in mind the damp and cold basement environment. The R-13 value on the system's EverLast insulated basement wall panels keep most of the heat in the basement and provides a barrier against water vapor. Our innovative ThermalDry® Insulated Floor Decking™ combines high-performance foam insulation with a moisture-resistant subfloor to give you a dry, warm, comfortable basement floor. Total Basement Finishing's EverLast™ insulated basement windows are all-vinyl, insulated double-paned windows—perfect for the basement environment. Call or contact us online for a FREE Basement Floor Quote.